It has a nice ring to it, don’t you think? And it seems like a natural progression from “Diapers and Divinity” because it more accurately reflects where my life is today. Or yesterday, if I’m going to be really specific. 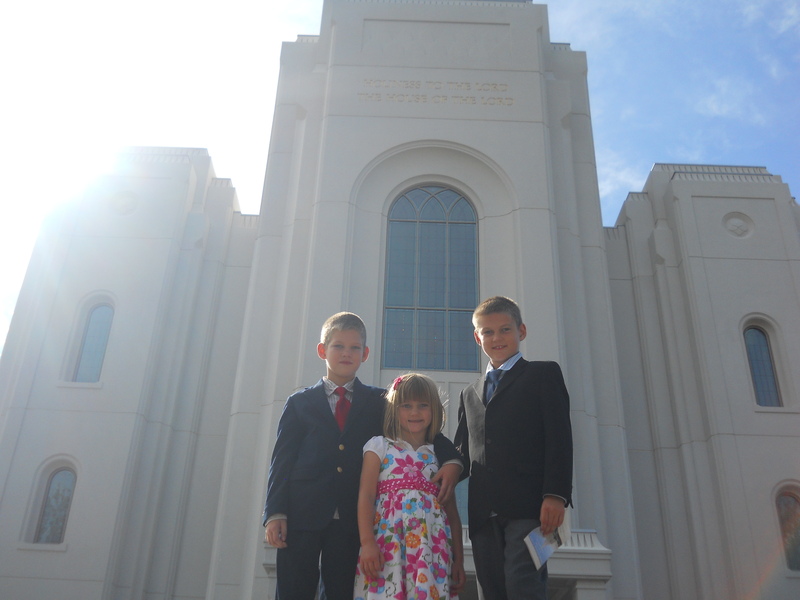 Yesterday, my family went to the Brigham City temple open house. I love temples because they are peaceful and lovely and the only building I know of where the whole entire thing is an emergency exit. When life feels a little frightening or overwhelming, it’s a safe place for my soul. That’s why I wanted to take my children. Don’t tell anybody official, but we went through the open house twice in a row. Grant wanted to go again because “I like the way it feels.” Me, too, buddy. Me too. And you know? Such is life. One minute things are glorious and celestial, and another minute you’re spending an hour in a gas station parking lot trying to figure out how to get the smell of horchata and bean burritos out of your brand new car’s upholstery without vomiting yourself. If we’re honest with ourselves, it seems some days are more vomit than temple, or more diapers than divinity, but today I’m trying to look at it like it’s a penny jar. Every time we see a glimpse of heaven in our children or our blessings or ourselves, it’s like dropping a coin in a jar that we’re saving up for something special. I guess what we end up purchasing with it is a “vacation” if you want to look ahead as far as heaven, but I think we’re earning our wings with each penny. We’re investing in who we know we can be. And like a temple under construction, despite the garbage in the world (or day) around us, we can somehow find and be a safe place for the people we love most. « So much to celebrate. Oh, friend. Vomit in a car is only eclipsed in grosserie by vomit in a carseat. I thank Heaven all the time that I haven’t had to do that particular brand of nasty for many years. you’ve raised a thoughtful son who is a great writer. gosh, i wonder how he comes by that? i just wanted to say that i think the wing earning comes with every diaper/tantrum/12-2-4-and-6am feeding that we approach with humor or grace or kindness. those are the moments when we don’t see our divinity, but Heavenly Father does. i think that’s the point of your entire blog, so this is a duh, but the penny analogy made me want to share. the great times keep me going, but they don’t keep me growing. We stopped by a Mexican restaurant after going to the Brigham city temple open house, great minds think alike! What a beautiful temple it was. Wish I could have gone through it twice but it was Labor day and the line to get in was around the block by the time we were finished! You know, I think I’d rather have vomit in my brand new car than spill a gallon of fuschia housepaint all over the backseat of my new car. With tan carpet and leather seats. True story. In the meantime, I think I will never eat at a Mexican restaurant again. While in Utah, we noticed Mexican restaurants EVERYWHERE and it seemed like, between Cafe Rio’s and Chipotle, that was all we ate. I never saw a sushi place anywhere. I think it is a fine name and very evocative of being a mother. I made it 5 1/2 years as a parent before I experienced throw up in the car. It was a good run. I’m glad you are back, I’ve missed your blog! I love that he corrected his spelling mistake! Even feeling sick is no excuse for using the wrong they’re. He is a true writer. This was THE perfect read for me today. I definitely had more diaper than divinity and probably lost any progress toward earning my wings I’ve ever made, but life goes on. We pick ourselves back up, we forgive each other and return to the business of being a family, an eternal family.